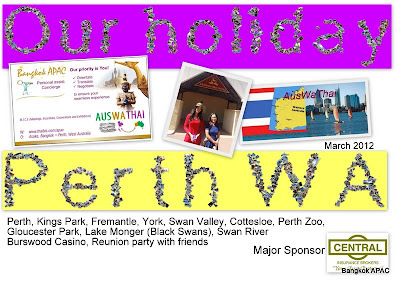 Ami and Arwee from Bangkok, on holiday to Perth West Australia. As members of Bangkok APAC, they host many visitors from W.A. Special thanks to Central Insurance Brokers, Perth WA for sponsoring this program. Unfortunately the program is NOT optimised due to multiple delays visa. Although both girls have travelled internationally, visa to Australia for certain countries, is not a positive processing culture. Taxi: Perth so expensive & difficult to get whereas Bangkok so cheap and everywhere? Compare: Perth much prettier landscape, colours are brilliant and vibrant. Compare: No Caravans in Thailand, I think because local Accommodation is so cheap. PT (Personal Trainer) session with Body Success at Central Insurance Brokers. Thursday: Day trip York > Collage > www (approx 100kms from Perth CBD) heritage. Tuesday: Ami returns to Bangkok, Arwee returns next week to host visitors for Songkran Festival begins April, it's Thailand most popular festival. Perth is beautiful, lovely colour and people very friendly. Everything is so far apart and expensive. Thank you to everyone to meet me and share your moment with me. Swan Valley: "never seen a grapevine"
Gloucester Park: "Never seen a horse race"
I will bo host for Ami as I've been to Perth several times. Last visit was July 2011. Horse racing: "never seen an event"
Vineyard & Golf club: "never seen"
Getting around from a tourism prospective; Perth is incredibly expensive and our Hospitality Industry is more Commercial than sincere. Special thanks to family & friends to co host. Lows: WA is so over regulated. We have so many laws; bi-laws, to keep honest people honest and an endless list of diverse excuses and stern warnings for law breakers? During the visit by staff from Central Insurance Brokers (late 2011 & early 2012) the idea was borne to create a "fund raiser" project to "raise a roof over the playground". We encourage groups to visit Bangkok, if your not able to go then consider the team synergy of to host a suitcase (donate clothes), see more in the fundraiser page.